What makes first-class honey? Is it the taste? The flavour? The colour? A lack of bubbly foam, dirt, bee lips, and assorted bee organs? It’s a personal choice, of course. Some like it spicy; some like it mild. 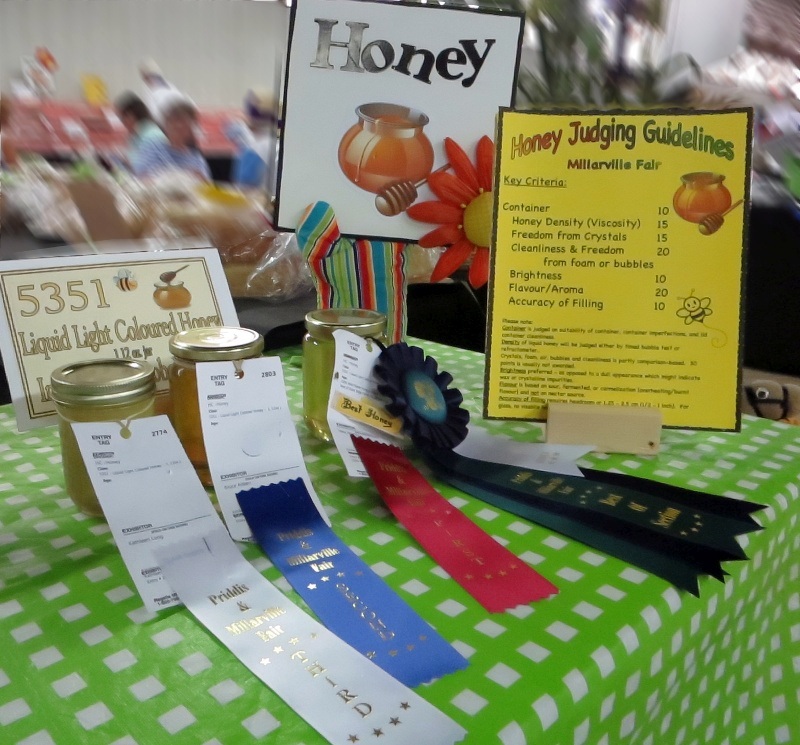 But the honey judge at the County Fair has to rise above personal quirks and has to select the Blue Ribbon Best of Show on something approaching non-biased criteria. I was a honey judge at the Millarville Fair today. For some reason, the number of entries was small. A few years ago, there were 40 jars of honey to critique. This year, there were far fewer – it is turning into a good honey year, so maybe all the beekeepers were busy with their bees. Nevertheless, judging proceeded and in the photo to your right you can see the First, Second, and Third Ribbon winners. It takes courage – and time and patience – to enter your honey into a contest. Kudos to those who dare to compete. And filter, fill jars, and finally present their homemade treasure for inspection by some odd character such as I. I tried to be fair. But we all know that wine and honey connoisseurs are snobs. Well, here is how you, too, can be a honey snob. If you can see the chart in this photograph, you can see how the honey entries are scored here in southern Alberta. Most of the graded factors are entirely objective. Container, for example, worth 10 of the 100 points, includes the appropriateness of the jar (sorry, re-used pickle bottles get fewer marks), cleanliness (not too sticky, please), and the container’s lid and surface condition (no chips on the glass or bent metal on the lid). And so it goes through the list. The only somewhat subjective attribute relates to flavour and taste. But this has nothing to do with the judge’s appreciation of honey. I may like the foulest, blackest buckwheat (an obvious personal defect in my psyche), but I have to rise above that and treat the whitest, mildest honey with equal respect. The attributes of flavour and taste must associate with the honey entry’s degree of suitable (or unsuitable) in quality despite any ravishes of heat or water. Too much heat in the processing spoils otherwise wonderful honey, darkening it and imparting a caramelized flavour. Too much water (moisture) in the honey quickly results in a sour or vinegary flavour – it will spoil. These are the things the judge is judging when flavour and taste are being examined. In the end, then, honey should be judged on its suitability as a food and on its bright and clean presentation. If you would like a copy of the scoring sheet I used for this purpose, you can download it here. This entry was posted in Culture, or lack thereof, Honey and tagged honey judging, Millarville Fair. Bookmark the permalink.